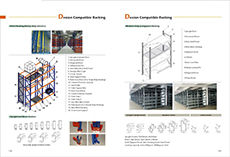 Cantilever storage shelving commonly known as beam type has a major, highly adapt to a wide range of mechanical access, select high efficiency etc. In the domestic variety of storage shelves system is the most common a form of shelves. The whole assembly, in the form of column piece + beam structure, structure concise and effective. According to the characteristics of container equipment storage unit equipped with, such as: gear, steel layer board (wood floor), metal mesh layer, storage cage guide functional accessories, etc. Meet different unit goods stored in the form of container equipment, the surface color is commonly pillar blue, beam and cross beam orange, and there are various colors to choose, create relaxed and bright storage space.